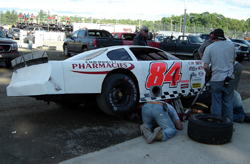 The July 3rd PASS race at Oxford Plains Speedway had all of the ingredients of a short track war. There was contact on the track, retaliation, a fight in the pits and a driver being led away from the track by police. The whole incident got fans buzzing, internet forums filling with rumors and opinions tossed around. The incident started with two laps to go in the PASS feature. Mike Rowe was leading and Mulkern was chasing him. The two made contact and Mulkern got sideways. The car behind them, the #00 of Mike’s son Ben, then made contact with Mulkern, who slid off the banking and into the dirt. On the next lap, Rowe came around for the white flag and Mulkern took a shot at him. Johnny Clark got by and won the race. “We had slight contact on the last restart and in the heat of the moment, I blamed Mike. After I calmed down, I realized that he really didn’t do anything wrong. He was leading and we made contact with our wheels. It jumped up into the air and if it wasn’t for that, I would have been OK. If we didn’t hit wheel to wheel, it would have been fine. Afterwards, Mulkern brought his car to Rowe’s pit and a physical altercation broke out between Mulkern and Rowe’s team. they felt that he drove dangerous off pit road after the incident. Mulkern goes to court to address those charges the week before the annual TD Banknorth Oxford 250. He still plans to compete in that event. 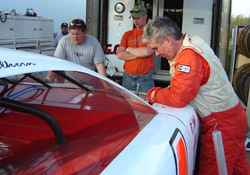 Mulkern has taken the last two PASS races off, but was in the pits as a spectator at White Mountain. He’s not leaving racing by any means and his time off is not completely because of what happened at Oxford. But the altercation between Scott Mulkern and Mike Rowe and the last lap of the race isn’t about two racers who are at each other throats. It’s more about a racing incident between two friends that got too heated. Mulkern talked to Speed51.com this week about the incident and instead of throwing around cross words and insults about his rival, Mulkern has instead expressed remorse about an on-track altercation that carried over too far. In fact, before the Oxford race, he confided in Rowe about the troubles with his own racecar. Rowe has apparently accepted Mulkern’s apology. At White Mountain, he saw Mulkern and asked where his firesuit was. Rowe then even offered Mulkern his back-up car to race. It takes a bigger man to admit he was wrong than one who would try to just let the incident keep building and building and Scott Mulkern has proved he is just that type of guy. We salute him for his comments. After all, it takes everyone to make this racing world go around.